In memory of Premanand (17 February 1930 - 4 October 2009), the great skeptic and human being, we reproduce the obituary we sent out to our contacts and published in Bangalore Skeptic (an ezine now defunct) in its October 2009 issue, which was brought out as a special issue on Premanand. This obituary has since been published on various other blogs and websites. We also reproduce an interview we had with him and published in the July 2008 issue of Bangalore Skeptic. 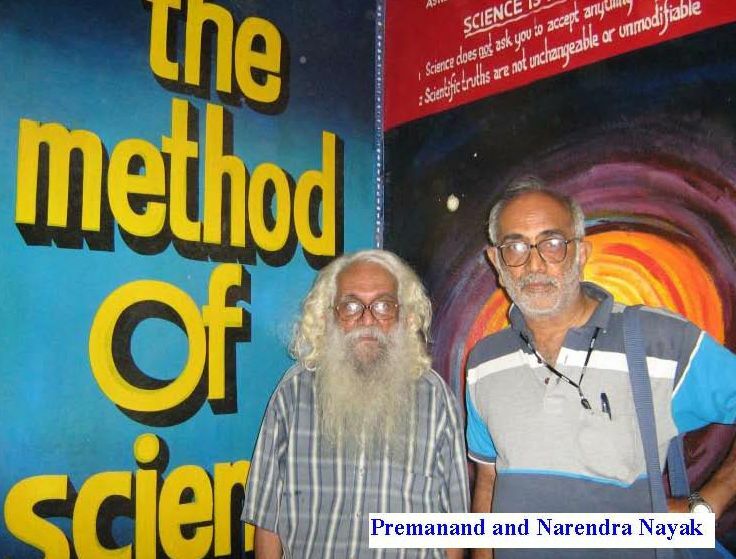 B. Premanand, the doyen of Indian rationalist movement, is no more. He breathed his last on October 4, 2009 at 2.20 pm at Podannur, Tamil Nadu. He was 79. According to his wishes, his body has been donated to the local medical college. Dr. Abraham Kovoor, who was in India for his “Miracle Exposure” lecture tour. That was a watershed o the life of Premanand, who immediately plunged headlong into the business of debunking spiritual tricksters. After Dr Kovoor’s death in 1978, Premanand continued Kovoor’s famous challenge of offering One Lakh Indian Rupees to anyone who could demonstrate psychic abilities under fraud-proof conditions. There, of course, have been no takers. 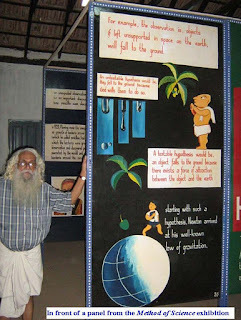 During his tumultuous campaign spanning over three exhilarating decades, Premanand visited almost every village and town in India exposing godmen and their miracles, conducting science workshops for the educated and the laypersons, giving public lectures and demonstrations. He visited about 49 countries with his mission to spread skepticism and critical thinking. He was given a Fellowship by National Council for Science and Technology Communication of Government of India for his efforts to spread scientific awareness. Premanand’s most famous target has of course been Puttaparthi Sai Baba, the number one spiritual fraudster in India for decades. Once he famously filed a Civil Writ Petition in Andhra Pradesh High Court against Sai Baba under Indian Gold Control Act! He wanted the government to proceed against Sai Baba for materializing gold from thin air because it was violative of Section 11 of the Gold Control Act, which mandated the permission of the Gold Control Administrator for manufacturing gold! Given the clout the godmen have among all strata of Indian society, it was not at all surprising that the case was dismissed by the court. Premanand had compiled a massive collection of records on the infamous murder of six individuals in Sai Baba’s ashram on 6 June 1993 and has brought it out as a book (Murders in Sai Baba’s Bedroom) running into more than 800 pages. This book is a “collector’s item” for those who want to know the truth behind the shady dealings in the ashram. For more than two decades Premanand published Indian Skeptic, a monthly magazine, dedicated to spreading rationalism and scientific temper. The magazine was an invaluable link between various rationalist groups and individuals in our overwhelmingly religious country. Through his Skeptic Book Club, he has brought out a number of books exposing godmen and their antics. His most popular book, Science versus Miracles, gives natural explanation of about 150 “miracles” including those commonly performed by the godmen in India. In November 2006 Premanand was diagnosed with cancer and underwent a major surgery. But this did not prevent him from continuing with his mission. Barely a couple of weeks after he underwent the surgery, Premanand attended a meeting of rationalists in Bangalore in January 2007, when Bangalore Vicharavadi Sangha (Bangalore Rationalist Association) was founded. He attended the 6th national conference of Federation of Indian Rationalist Associations (FIRA), of which he was the founder-convener, held in Pune in April 2007 and accepted an award (for his contribution to rationalist movement in India) presented to him by Maharashtra Andhrashraddha Nirmoolan Samithi. He attended the 25th state conference of Kerala Yukthivadi Sangam (Kerala Rationalist Association) held in December 2007 in Thiruvananthapuram. 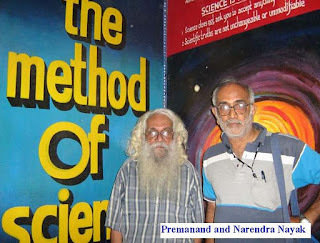 Premanand continued to bring out Bangalore Skeptic every month without missing even a single until late 2008 and published a number of books through his Skeptic Book Club. Despite his failing health, he completed and opened to the public on March 5, 2009 his long-cherished project – a permanent exhibition on the Method of Science, at Podannur, Tamil Nadu. His deathbed testimonial made September 20, 2009 re-affirmed his commitment to atheism and other rationalist convictions with which he lived by. It would have been a greater tribute to do some humanitarian services in his memory. Mere rationality did not do any good to the millions in the country. Building a school, hospital, old home, and several such public activities can immortalise him. Like the Indian Skeptic magazine, after sometime, he will also be forgotten. John Maynard Keyenes once famously said “In the long run, we are all dead”. We can very well also say, “In the long run, we will all be forgotten”. What we can do in our momentary existence is to do our bit to improve the life of all – at least leave the world without worsening it.